Luma, 500 First St., Petaluma. 707.658.1940. 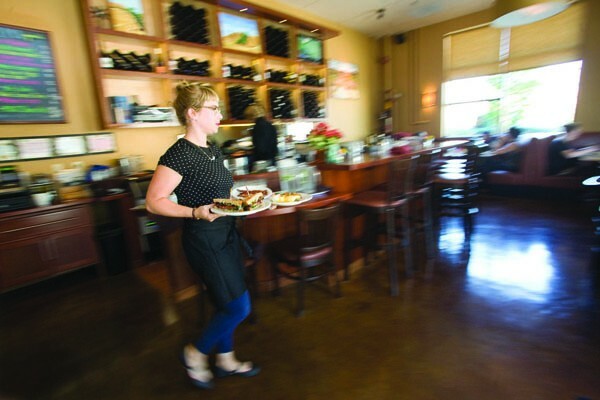 THE LOCAL Luma's welcoming neighborhood-restaurant appeal hits its firmest stride at brunch. From certain angles, downtown Petaluma looks like San Francisco, which isn't surprising since many of its buildings survived the 1906 earthquake. The row of buildings on Kentucky Street sloping up from Washington looks like a neighborhood in Russian Hill, and just south of downtown, the Foundry Wharf feels like a cross between south of Market and Mission Bay with its industrial buildings, modern condos and streets with bumpy timber, brick and old streetcar tracks. First Street's Luma Restaurant has read the neighborhood well. The bright and modern building, set below a block of smart-looking condos with tiny, brushed-aluminum balconies, looks like it was plucked right off the streets of San Francisco. It's got big-city style, with the welcoming appeal of a neighborhood restaurant. The food, however, doesn't quite deliver on casual urban sophistication. The food takes on bistro standards as well as Asian and Mexican influences; to me, it's a menu that doesn't quite know what it wants to be. Most might agree—it's an odd choice to run a chicken liver mousse special alongside guacamole and chips. The chicken liver mousse ($9), with a beautiful layer of chicken fat shimmering on top, was the best starter of the lot. The crab cakes ($12) were mushy owing to the abundance of bread crumbs and dearth of the starring ingredient, crab. Luma boasts its reliance on local produce, but I was underwhelmed by the choice of salads, a bland arugula salad ($8) and an unremarkable little gems salad in a blue cheese vinaigrette ($11). Entrées were mixed. The best dish I had was the brick-roasted half chicken ($24) accompanied by a savory mushroom bread pudding with a preserved lemon and garlic jus. The bar for thin-crust pizza is high, and the crust of Luma's margherita pizza ($11) made for a second-tier pie. The miso-glazed black cod ($26) was listed as a special, but it arrived no different than what you'd find at other places serving the same thing. The ancho chile and porcini-crusted hanger steak ($20) looked more like a tenderloin, and it was indeed tender, but the bitter, spicy dust of the dried chiles overpowered it. I did like the chimichurri sauce, though, and the creamy vegetable-quinoa purée served with it. Brunch suits Luma well. Locals saunter in with Sunday papers, grab a comfy booth and a cup of coffee and take their time over hearty but refined dishes like crab-cake Benedict ($19) and a decent version of chilaquiles with black beans ($11). Luma also serves a changing lineup of aqua frescas ($3), fresh fruit drinks like watermelon and mint. Desserts are standard fare—pot de crème, fruit crisp, chocolate cake, banana split. Luma touts its Key lime pie ($9); it tastes like a lime-flavored cheesecake with a dark chocolate cookie crust. The chocolate pot de crème ($7) was plenty chocolately, but instead of a rich custard, it was more like a thick chocolate ganache. Though a serviceable neighborhood restaurant, Luma may need to exert some more creativity or finesse the standards to bring in those who live further away, something I think the restaurant could easily accomplish.